Benefits cap of £26,000 - could this be a Great British Gerrymander? The first is to move the boundaries of the constituency to exclude those you don't want and envelope those you do. This "re-districting" is a favorite tactic in the USA, with its meandering congressional districts exemplified by Congressional District 12 in North Carolina. In 2003 the "Texas Eleven", eleven state senators, went on the run to prevent the state senate having a quorum to pass a re-districting that would gnaw on their own electoral prospects. Which is one consequence - intended or unintended - of the £26,000 benefits cap rushing through parliament. This time not restricted to a single city council. This proposal brings potential benefit to both Labour and Conservative parties by concentrating their presumed supporters. Less clear how this helps the Lib-Dems though. Too upset to comment. Totally let down by the Government. My fear is that people won't be able to move to alternative areas anyway (not that they should) because local councils now have policies in place whereby you have to prove your longstanding local connection before they have an obligation to you. Then if people are absolutely forced to move they will lose so much, all their networks of support, schools, all sorts of things. 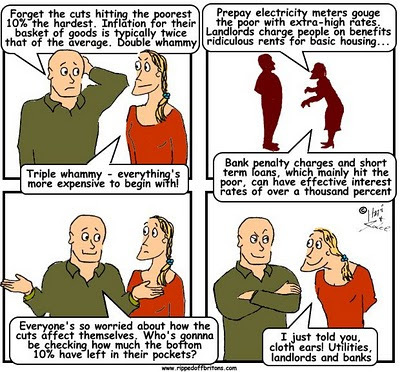 It's total persecution of the poorest and most vulnerable people in Britain. 26k is quite a lot to sit around on your arse all day and also quite a lot more than many honest hardworking people earn in the private sector. No, actually it isn't. The poverty line is £16K. The problem is wages are too low, benefits are not generous at all. This government says they make work pay. BUT. It beggars belief when if a person moves from one part of the country to say London, they get a job, but it does not pay much, they have to rely on working tax credits and housing support to live where the job is. Then they make it harder for someone to get working tax credit and freeze housing support. that then mean the person can no longer afford to take the job. NOW. MP's get housing support. Only they call it allowance. An MP is a job like any other. So why are MP's allowed no limits on what they can claim, but 'hard working people' are restricted on the help they can get? I think most people will think an income net oftax £26,000 to be reasonable. I do feel for those looking for housing in London (benbenefits or not) but think that's a consequence of supply and demand not political manipulation as the piece suggests. I think some people completely misunderstand benefits. First of all the governments takes back 20% on majority of purchases, secondly benefits are taxable and thirdly vast numbers on 'benefits' are working. The issue isn't too high benefits it's scammed workers being paid crap pay. Regarding London and the class cleansing policy of this government - they are a bunch if bigots who cheat and lie to get into power to pass laws that impoverish millions, killing a few in the process, whilst off-shoring their own ill gotten gains and planning their own protection from the next crash they themselves will cause. Oh yes and also removing rights to challenge them at the same time. They really are not nice people.